Borneo is one of the regions that have most diverse ecosystem and many primates inhabit there. At the same time, however, population of some species has decreased because of decreasing of their habitat. Objectives of this trip were to learn about conservation of primates by seeing the rainforest, plantation and conservation activities. 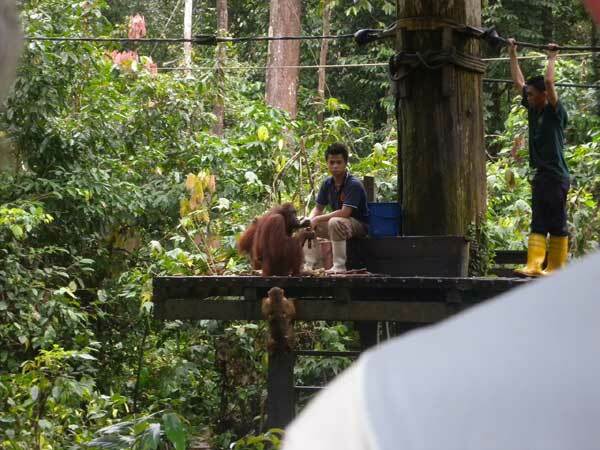 In the Sepilok Orangutan Rehabilitation Centre, we observed provisioning rehabilitant orangutans. They are in the initial stage of rehabilitation. Wild pig-tailed and long-tailed macaques also gathered there. We also visited rehabilitation facility, and saw an orangutan before the reintroduction to the forest. After that, we visited Rainforest Discovery Centre and learned about the highly diverse tropical forests of Borneo. 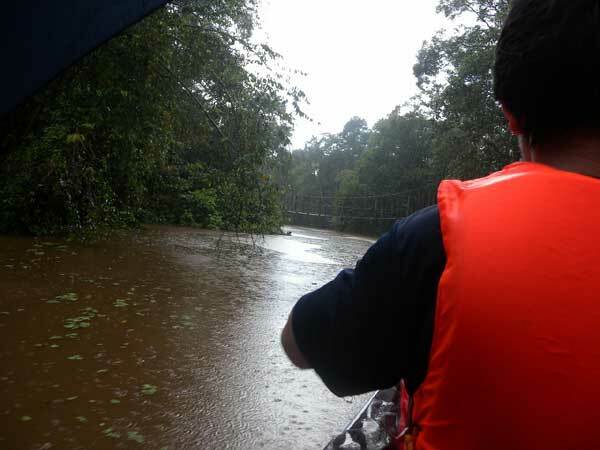 In Sukau, we cruised along the Kinabatangan river to see the suspension bridges made of fire hoses. They were made for orangutans to cross the river surrounded by oil palm plantations close to the rainforest. We observed proboscis monkeys and other animals. A coordinator of the Kinabatangan Orangutan Conservation Project gave us a lecture of their activities. This project aims to restore symbiotic relationships between human and orangutan, and they are conducting research, education and conservation activities. Having his lecture, I felt the difficulty of the conservation of tropical forest and primates again. In the Danum Vallay Conservation Area, we walked in the rainforest, and observed orangutans, gibbons, and other animals and plants. Luckily, we observed the orangutan building her nest in the evening, and eating bark on the next morning. Dr. Henry Bernard showed us the research facilities of Institute for Tropical Biology and Conservation, University Malaysia Sabah (UMS). In addition, at each place, we met Japanese primatologists that studying currently in Borneo, and we had opportunities to hear about their specialty and their life. Orangutan feeding in the Sepilok Orangutan Rehabilitation Centre. Suspension bridge made of fire hose for orangutan.